The negative environmental effects of media culture are not often acknowledged: the fuel required to keep huge server farms in operation, landfills full of high tech junk, and the extraction of rare minerals for devices reliant on them are just some of the hidden costs of the contemporary mediascape. 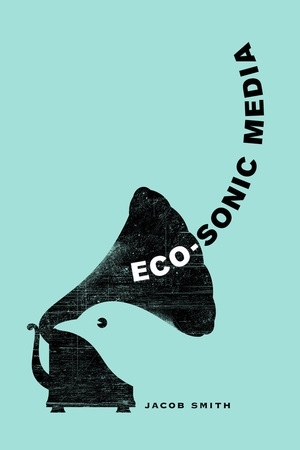 Eco-Sonic Media brings an ecological critique to the history of sound media technologies in order to amplify the environmental undertones in sound studies and turn up the audio in discussions of greening the media. By looking at early and neglected forms of sound technology, Jacob Smith seeks to create a revisionist, ecologically aware history of sound media. Delving into the history of pre-electronic media like hand-cranked gramophones, comparatively eco-friendly media artifacts such as the shellac discs that preceded the use of petroleum-based vinyl, early forms of portable technology like divining rods, and even the use of songbirds as domestic music machines, Smith builds a scaffolding of historical case studies to demonstrate how “green media archaeology” can make sound studies vibrate at an ecological frequency while opening the ears of eco-criticism. Throughout this eye-opening and timely book he makes readers more aware of the costs and consequences of their personal media consumption by prompting comparisons with non-digital, non-electronic technologies and by offering different ways in which sound media can become eco-sonic media. In the process, he forges interdisciplinary connections, opens new avenues of research, and poses fresh theoretical questions for scholars and students of media, sound studies, and contemporary environmental history. Jacob Smith is Associate Professor in the Department of Radio, Television, and Film in the School of Communication at Northwestern University. He is the author of Vocal Tracks: Performance and Sound Media, Spoken Word: Postwar American Phonograph Cultures, and The Thrill Makers: Celebrity, Masculinity, and Stunt Performance.